However since most of us have Aeroplan miles over MileagePlus miles or even Turkish Miles&Smiles miles I decided to give it a go on Aeroplan and there are even more options than what United brings up (and you don't have to go via the U.S.) Here is just one screenshot of where you can get 4 Business Class tickets between Toronto and Istanbul for travel during the high season (this was a one way search but as you can see from the graphic above there are quite a few days showing availability for 4 seats return. 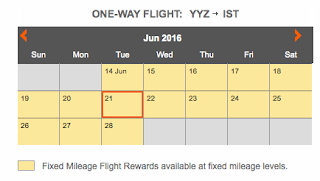 Granted the second option below has an economy class leg but that is for the short YYZ-YUL flight. So 210,000 miles (52,500 per person) and $221.84 ($55.21 per person) total in taxes. Not bad at all! 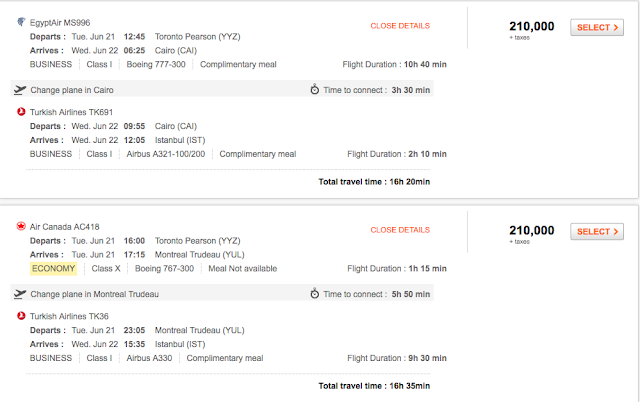 Some of the U.S. blogs were showing up to 8 business class seats available on the U.S. Turkish Airlines departures so there is lots of potential to use your Aeroplan miles here to get Business Class travel to Turkey! Our examples only show flights from Toronto but you should be able to connect from most major Canadian cities to the various options shown above. You could technically get enough miles for the one way flight with AeroplanPlus Reserve Card which has a sign up bonus of 60,000 miles until Oct 31 or check out our post on how to earn up to 100,000 Aeroplan Miles or more with various credit cards for free. Granted however by the time you get the card and get the miles posted these great business class offers could be gone. Do you plan on or have you already jumped on this offer?